Researchers Nicholas Pilford and colleagues (including Derocher) looked at summer swimming data from 76 polar bears fitted with collars and ear tags from the Eastern Beaufort Sea in 2007-2012 and combined them with data from Western Hudson Bay bears. Most Beaufort Sea bears spend the summer on the sea ice while all Hudson Bay bears spend the summer onshore, making this a particularly odd coupling. Not surprisingly, the Hudson Bay data were unimpressive. 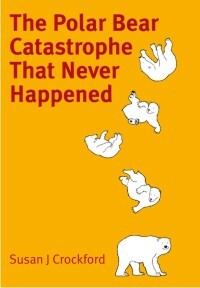 However, no Beaufort Sea bears died as a result of swims undertaken between 2007 and 2012, even in 2012 when summer sea ice was the lowest it has been since 1979 or in 2007, when the summer ice was second-lowest. No evidence is presented in the paper of any harm or ill-effect of swimming the distances required. “During the open water period in the BS, some polar bears take refuge on land, while the majority follow the retreating pack ice (Amstrup et al. 2000, Schliebe et al. 2008). In the BS, swims were more frequent than HB, and most started and ended in the pack ice. Results suggest that swims in the BS are primarily related to polar bears following the pack ice edge as it retreats. During spring, polar bears of the BS preferentially hunt seals in active ice, selecting for areas near the shorefast ice boundary (Pilfold et al. 2014). “Pagano and colleagues calculated the mean distance between the mainland coast and the sea ice edge at the end of September for each year of the study period. This distance varied from a low of about 200 km (achieved in 2005, 2006, and 2009) and a high of about 430 km (achieved in 2008). Mean distance from the shore to the ice in 2004 was about 300 km and in 2007, it was about 380 km. Each of these measurements varied somewhat depending on the configuration of the shoreline, but in 2008 the ice edge was definitely the furthest away than in all other years back to 1979. However, the largest number of long-distance swimming events took place in 2009, when the ice edge in this region was about the same distance offshore as in 2005 and 2006. The longest swim was recorded in late August/early September of 2008 at a point where the sea ice was >500 km offshore: a female with a yearly cub swam 687.1 km in just over 9 days, as described in detail by Durner et al. (2011). This bear was one of only two individuals in the Pagano et al. study described here that swam from land to the main pack ice edge; after a few weeks meandering around at the edge of the pack ice, this bear then walked back to shore on the rapid-forming ice, arriving on land at the end of October. The second longest swim (366.0 km) was recorded in 2005, when the pack ice edge was about the same distance offshore as in 2009. Pagano et al. 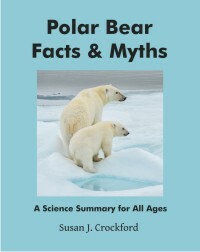 conclude: “we show that both adult female polar bears and their dependent young possess an ability to swim long distances.” They also state that “most of the long-distance swimming events that we identified involved bears swimming from unconsolidated sea ice to the main pack ice or to land.” In other words, few swims recorded were from land to sea ice, indicating that during the open water season, most southern Beaufort and Chukchi Sea polar bears are on the sea ice, not on land — a point also made by Durner et al. (2011). 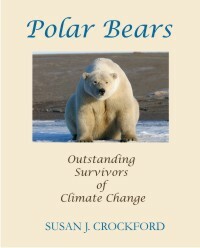 In addition, the results of this study suggest that despite there being little or nothing for female polar bears and their cubs to eat on shore during the late summer months in the southern Beaufort Sea, the few bears that remain on shore are apparently not so hungry that they are undertaking long-distance swims to the pack ice to relieve their fast, although they appear able to do so. The study, published in Ecography, was accomplished using satellite linked telemetry tracked polar bears from the Beaufort Sea and Hudson Bay populations. Results of the study show an increase in long-distance swimming associated with climate-mediated reductions in sea ice. In 2012, 69% of the tracked adult females in the Beaufort Sea swam more than 50km at least once, the same year in which Arctic sea ice hit a record low. This entry was posted in Life History, Sea ice habitat and tagged Beaufort, Derocher, forced swims, Hudson Bay, mothers with young cubs, Pilfold, polar bear, receding sea ice, sea ice, summer, swim longer, swimming, swimming further. Bookmark the permalink.